THERE’S NO GETTING away from it, during the early 90s there were an enormous amount of hard rock bands that, although extremely talented, failed to connect with an audience. This was primarily due to the shifting sands of time and taste, with the media almost exclusively focussed on the sounds of Seattle, and, in particular, the emerging grunge movement. It was this obsession with a new trend that resulted in a number of perfectly serviceable groups being consciously sidelined. 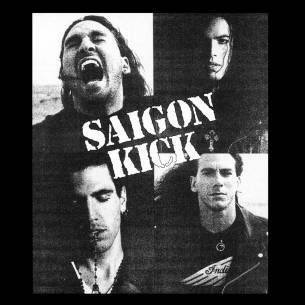 Saigon Kick was one such example. Formed in Florida during the late 80s, this storming four man unit, led by vocalist Matt Kramer and guitarist Jason Bieler, crafted a particularly potent brand of hard rock that relied as much on power pop as it did on heavy riffs. It was an interesting twist on traditional rock and much edgier, leading to valid comparisons with other similar groups such as Love/Hate, the Wildhearts, Redd Kross, Cheap Trick and Kings X. There was also a perceptible psychedelic tinge to the arrangements helping the band to rise above the standard competition by a considerable margin. Produced by Michael Wagener (Skid Row, Extreme, Ozzy Osbourne), and released on Atlantic records (via Michael Douglas’s Third Stone imprint), the record had been taped at a frantic pace in Los Angeles. Released in 1991 it sold well and quickly established the band as exciting contenders. The album contains a number of instantly catchy tracks, including ‘What You Say’, ‘Down By The Ocean’, ‘Love Of God’ and ‘Coming Home’. It was an impressive enough debut to warrant Atlantic records making a commitment to album number two.